Hon'ble Justice F M Ibrahim Kalifulla has delivered a historic judgement rendering substantive justice to the unmourned, unhung and unsung common man in Chennai by ordering fresh elections to 99 wards out of 155 wards and directing the State Election Commission (SEC) to recall election certificates issued to candidates elected from these wards. The matter has been referred to Hon'ble Chief Justice A P Shah for appropriate orders. Through his judgement, Mr Justice Kalifulla has given cubic content to the immortal words of Justice Felix Frankfurter: 'Judges are not merely the habitations of bloodless categories of the law which pursue their pre-destined ends'. Instead of taking a sterile, bloodless and neutrally neutral view between good and evil, he has categorically declared: 'In a democratic set up holding of elections in a free and fair manner assumes great importance'. He has referred to the word of caution given by the Supreme Court of India to the effect that successful candidates who had resorted to foul methods should not be allowed to reap the benefits. He has also stated that he was convinced that 'there was an extreme and extraordinary situation', which warranted an extraordinary remedy in view of the magnitude of the situation. He has concluded that it would be wholly inappropriate if fresh elections were not ordered to a majority of the wards. By his verdict setting aside the civic elections in 99 wards out of 155 wards, Mr Justice Kalifulla has demonstrated that another great American Judge and Jurist Benjamin N Cardozo (1870-1938) was absolutely right when he stated: 'The great tides and currents which engulf the rest of men, do not turn aside in their course, and pass the judges by'. Mr Justice Kalifulla in his judgement has expressed concern that it is unfortunate that the State Election Commission did not raise even its little finger though an extraordinary situation was unfolding on 13 October, 2006, when the civic election to Chennai Corporation was being held. He has passed severe strictures against the State Election Authority. In his judgement he has declared that the stand and attitude of the State Election Commissioner (SEC) was 'highly irresponsible' and that he had 'miserably failed in the discharge of his function'. The law-abiding citizens of Chennai had a lurking suspicion right from the beginning that the State Election Commission needlessly functioned as a branch office of the DMK Party from the day on which the elections were notified. This suspicion has now been confirmed by the Judgement of Mr Justice Kalifulla. Severely indicting the SEC's failure to give even the minimum details about the steps taken by him either to control rigging and booth capturing or restore normalcy to ensure the conduct of free and fair polls on 13 October, 2006, the Hon'ble Judge has said: 'to say the least, the stand of the SEC can only be construed as a highly irresponsible one and was not in the interest of protecting democracy. Instead, it can only be stated as an indifferent attitude displayed without realizing the responsibility reposed on him'. In conclusion, Mr Justice Kalifulla said that the SEC had thoroughly failed to come up to the expectation and that he had displayed a totally indifferent attitude for reasons best known to him and thereby failed to ensure a free and fair poll. To quote his words once again: 'Every one of the incidents and details, besides the failure of the SEC to react to the situation, contributed to an extreme and extraordinary situation and it called for an extraordinary remedy. It will have to be held that there was no free and fair election on 13 October, 2006'. The enlightened public in Chennai are fully aware of the fact that the SEC functioned only as a spokesman for the ruling DMK party and not as an impartial public election authority. All the complaints made to the SEC were either ignored or treated with contempt or were simply forwarded to the Commissioner of Police, who in turn showed no better perception than that shown by the SEC. In regard to the complaints of snatching of ballot papers and rigging, the SEC had come forward with a simple categorical denial of the allegations and had stated that such incidents had been blown out of proportion. Mr Justice Kalifulla has wondered as to how the SEC could come forward with such a blatant denial. Mr Justice Kalifulla has also criticized the Director General of Police and the Commissioner of Police for having taken the pre-meditated view that the violent and ugly incidents were only 'sporadic'. To quote the exact words of Mr Justice Kalifulla: 'I am constrained to state that such a stand taken by these police authorities was far from truth and did not reveal the correct state of affairs'. The High Court has come to the right conclusion that the police officials on par with the SEC failed in the performance of their statutory functions. Soon after the civic elections, Union Panchayati Raj Minister Mani Shankar Aiyar had described as 'aberrations,' the difficulties faced in holding 'free and fair' panchayat elections in Tamilnadu. He pointed out that enquiries had been ordered into the incidents. All the major English and vernacular newspapers in India had carried detailed reports and graphic pictures about the violent and ugly incidents that marred the Chennai Corporation Council elections. The SEC and the Tamilnadu Government treated these incidents as minor episodes which had taken place in a remote district in Central China or Iceland! All the newspapers had exposed in one ringing voice the massive rigging of elections on an unprecedented scale in Chennai City. It was reported that in a precisely planned operation, supporters and henchmen of the ruling Dravida Munnetra Kazhagam (DMK) drove out poll officers and party agents at knife point, captured polling booths and the ballot boxes with ballot papers and voted for their party candidates. Candidates of the rival All India Anna Dravida Munnetra Kazhagam (AIADMK) and Marumalarchi Dravida Munnetra Kazhagam (MDMK) or even an ally like the Communist Party of India (Marxist), who resisted, were assaulted. D. Pandian, State secretary of the CPI, called it 'a misguided adventure' while G Ramakrishnan, CPI(M) State secretariat member, described the incidents as 'a planned operation'. In a strongly worded statement, N Varadarajan, State secretary of the CPI(M), called the incidents 'shocking' and charged that some DMK candidates and legislators led 'armed, professional rowdy groups' to capture polling booths. False cases under non-bailable offences were booked against CPI(M) district committee leaders like Devi. Complaints to SEC officials were of no avail. There were widespread demonstrations by almost all political parties against the planned rigging of elections by the DMK Party. Cadres of the Communist Party of India (Marxist) staged a demonstration at Dindigul condemning the violence during local body elections in Chennai. They demanded stern action against those involved in it. 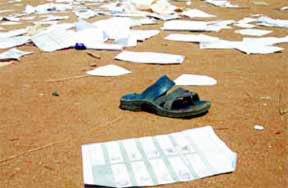 K Balabarathi, MLA, said that the violence was a 'murder of democracy'. Though the CPI (M) was part of the Democratic Progressive Alliance, it would not tolerate such anti-democratic incidents. She described it as pre-planned violence and alleged that persons had been mobilized from different parts of the State to commit atrocities. Against this known background, the historic judgement of Mr Justice Kalifullah comes as a great relief to the frustrated, innocent and law abiding voters of Chennai City. Reading the inspiring judgement of this great judge, I am reminded of another landmark judgement given by Chief Justice William Murray, Lord Mansfield in 1770 in England. In this judgement, he came out with the following inspiring words: 'I will not do that which my conscience tells me is wrong, upon this occasion, to gain the huzzas of thousands, or the daily praise of all the papers which come from the Press. I will not avoid doing what I think is right, though it should draw on me the whole artillery of libels; all that falsehood and malice can invent, or the credulity of a deluded populace can swallow'.